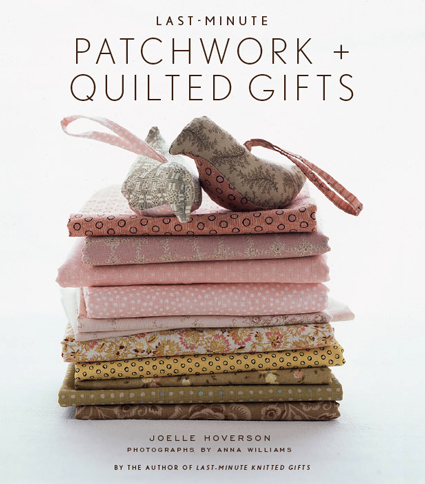 Look what I’ve finally got in my hot little hands, Last Minute Patchwork & Quilted Gifts by Joelle Hoverson. It’s got everything I look for in a sewing book; it’s beautifully styled and photographed (by Anna Williams), full of many, many enticing projects (unlike the stacks of books I’ve bought for only 1 or 2 projects), clear instructions and passes the truest test of a craft book… has something that I have to drop everything for and make straight away like this pincushion. Oh yes, and it doesn’t hurt that one of my patterns is in there 🙂 Thanks so much Joelle for including Peanut. I’m really proud to be a part of your gorgeous book! Love peanut! I just got the book and it’s fantastic! Congratulations on having pattern in this great book! My copy is on its way to me as well! I’m looking forward to exploring it, and of course trying Peanut. Just got mine, too! LOVELY! Oh I love Peanut. How lovely to see your work in the book. I really really really should not buy any more books …but surely one more won’t hurt! I just took my copy round to a friends – her daughters were besotted with Peanut, adding to my list of treats to make them. peanut is so cute! great job. i’ll be looking for this book for sure. I am certainly going to get this one! I sold at the cover, but Peanut flashes *must-have-now*! I just received my copy today! I LOVE it!!! The first must have for me was peanut! I have a nephew’s birthday and I thought peanut would be perfect! I have to have it!! And peanut is devine. Congratulations!!!!!!!!!!!!!!!!! The book looks lovely, and Peanut is just gorgeous! I think I’ll have to try and get hold of a copy when it’s released here in Australia. Can someone fall in love with a sewing book? Answer: YES. Can’t wait to make Peanut when my copy makes it to me here in Mexico! P.S. Love the new Make-a-long chapter! I’d like to have a book of your patterns, too. Pond? the Wildcam on National Geographic’s site- right now it’s featuring a game preserve in Botswana. many elephants, and many little ones. a croc lives there, too. I can barely wait to get this book. Peanut is seriously insanely adorable. I got my book too, Peanut photographed beautifully. I loved seeing her pop up on the just sweet enough quilt page too! Adorable. Congrats! I heart Peanut and the pincushion! I was really, really pleased to see your pattern in this book — and pleased that it looked like a book to buy and use again and again. I cannot stop drooling. 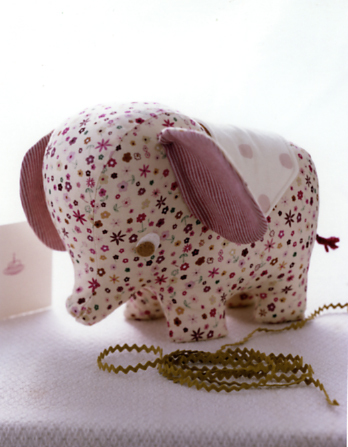 That elephant is so cute and I just love the fabric! I’m looking forward to checking out the book. Ooh, I just ordered mine on Amazon. Can’t wait to get it! That book is being added to the “coveted” list. Peanut looks wonderful! Especially the fabric choices. Did you choose them? whoo-hooo!! I am so excited to get this book-and congrats. it looks amazing. Oh I love the last minute-gift books, and this one looks great. Congrats! Congrats on your little elephant. I just picked up a copy of this book on Friday, and it’s very hard to put down. Tough to decide what to try first. Of course there’s your elephant…. Argh, now I have to find shelf space for another craft book – Peanut is just adorable and I simply must make him! The book looks great. Peanut is so cute! congratulations to you! Can’t wait to see that one for myself. I love that book. I got it last month and can’t decide what to make. congratulations on being a part of the book! Peanut is too cute. Adding the book to my Amazon wishlist. Also wanted to add that I think your blog is wonderful. congratulations on your being in the book. o my gosh, look at how i am writing. i meant peanut. it is way too late, 12:30 AM. that gets me in trouble. Gorgeous Peanut… Gorgeous book -I received my copy yesterday,being in Australia that was a small miracle! I’ve already made Peanut and have ordered more of your patterns from Purl Soho. Thanks for the inspiration. I am in love with Peanut. Hi Hillary–I just bought the book after also seeing it excerpted in M. Stewart. It is Gorgeous, and you are a star to be in it–Peanut is the cutest! Congrats!! How funny and strange. I just stumbled onto your blog the other day because Oscar’s clothing quilt was on someone else’s site – listed as inspiration. Then today, looking for Amy Butler’s new book Midwest Modern, I saw the Hoverson book and picked it up also! Then, imagine my “small world” suprise when I read this post! Too wierd. Can’t wait to make my own Peanut! Your site and crafts are gorgeous – thanks for sharing your talent with us! The book looks fantastic. I’ll keep an eye out for it in the bookshelves here in Australia. Thanks for the inspiration and the link. Oh my gosh, this little elephant is just adorable. I have this book & I love it! It’s beautiful and I love the wee elephant design! SO CUTE! NOOOOOOOOO Don’t poke Peanut! Way too cute to be a pincushion! Congratulations on you success! I bought this book for the Peanut pattern and I made this as a gift last week. My recipient loved it and all my friends are clattering for elephants of their own. I have pictures of my project on my blog at http://www.rivkiyarns.blogspot.com. Love the pattern and just made one of the cute peanut this week. It was m second tr and this time I think it turned out ok. If ou like to look, it is on m blog. I love Peanut. My problem is I thought I was more than capable of creating him, and yet I seem to need a visual tutorial. Am I the only simple person out there? It can be a little tricky to follow without a diagram. Joelle pointed me to this thread here that seems to clear it up for everyone. Let me know if you’re still stuck. I just found a used copy of the original book, but it no longer contains the pattern for Peanut. Is there anywhere I can purchase the pattern?